Scientists from Carnegie and Smithsonian museums and the University of Utah today unveiled the discovery, naming and description of a sharp-clawed, 500-pound, bird-like dinosaur that roamed the Dakotas with T. rex 66 million years ago and looked like an 11 ½-foot-long "chicken from hell." 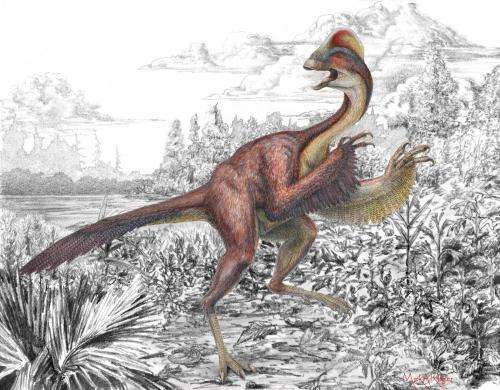 "It was a giant raptor, but with a chicken-like head and presumably feathers. The animal stood about 10 feet tall, so it would be scary as well as absurd to encounter," says University of Utah biology postdoctoral fellow Emma Schachner, a co-author of a new study of the dinosaur. It was published online today in PLOS ONE, a journal of the Public Library of Science. 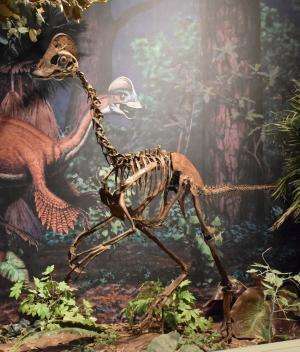 The study's lead author, Matt Lamanna of the Carnegie Museum of Natural History in Pittsburgh, says: "We jokingly call this thing the 'chicken from hell,' and I think that's pretty appropriate." The beaked dinosaur's formal name is Anzu wyliei – Anzu after a bird-like demon in Mesopotamian mythology, and wyliei after a boy named Wylie, the dinosaur-loving grandson of a Carnegie Museums of Pittsburgh trustee. Schachner and Lamanna were joined in the new study and description of three specimens by Hans-Dieter Sues and Tyler Lyson of the Smithsonian Institution's National Museum of Natural History in Washington. 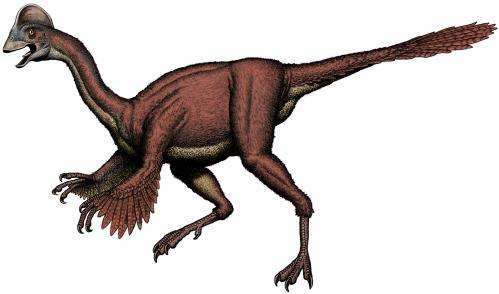 Anzu is also "one of the youngest oviraptorosaurs known, meaning it lived very close to the dinosaur extinction event" blamed on an asteroid striking Earth 65 million years ago, Schachner says. "Two of the specimens display evidence of pathology," Schachner says. "One appears to have a broken and healed rib, and the other has evidence of some sort of trauma to a toe." This is a mounted replica skeleton of the new oviraptorosaurian dinosaur species Anzu wyliei on display in the Dinosaurs in Their Time exhibition at Carnegie Museum of Natural History, Pittsburgh, Pa., USA. Credit: Carnegie Museum of Natural History. 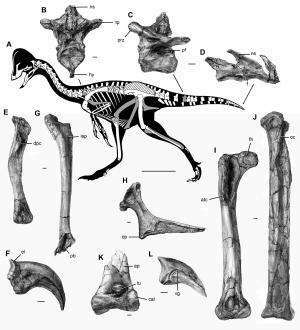 Like many "new" dinosaurs, Anzu wyliei fossils were discovered some years ago, and it took more time for researchers to study the fossils and write and publish a formal scientific description. As a graduate student at the University of Pennsylvania, Schachner helped Lyson excavate the least complete specimen – six bones from the neck, forelimbs and shoulder – in North Dakota. The Carnegie Museum obtained the other specimens. 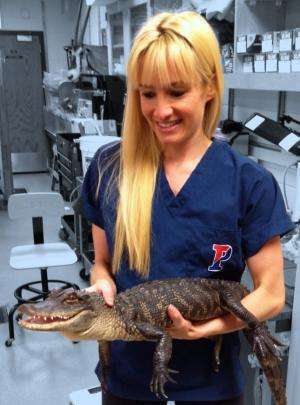 "It took years since all of us had busy schedules, and I moved to Utah in 2010 to work on reptile respiratory evolution," she says. The study's four authors finally met for a week at the Carnegie Museum to work on the dinosaur together. Among other tasks, Schachner illustrated and photographed some of the bones. She says the process was "really exciting. Naming a dinosaur is one of those things I've wanted to be involved in since I was a kid." For some reason, dinosaurs - no matter what species or from what time - are always depicted as exhibiting the fiercest, most ferocious expressions. In fact, I am certain that they were all lovably cute-looking creatures in their own right, with big shiny eyes and pleasing dispositions, because the farther back you go, the more innocent life gets. Man is the fiercest, most ferocious creature that ever evolved on this world, and humans have this strange and shallow obsession with beauty, with which fierceness and ferocity are incompatible. There is an opening somewhere for a paleontological psychologist. I want to start seeing cute dinosaurs. Think ostrich eyes with long eyelashes. Love is the merry-go-round that throws life off superfluously.
" because the farther back you go, the more innocent life gets"
Nonsense, living creatures have been brutally killing other living creatures for nearly as long as their have been living creatures. it is called survival of the fittest for a reason. and probably vice versa. if the tribe is big enough maybe 2 weeks. 5 stars for Emma Schachner, a real life example of one of Cussler's female scientists in his novels! Yeah, for example, crocodiles and sharks who ascendancy go back hundreds of millions of years, are as cuddly as babies. They do all the cuddling, though.